Like you, I'm determined to make the mythical organized home of my dreams a reality this year. I won't do it by shopping for expensive and unnecessary storage supplies. Instead, I'll be thrifty and creative. 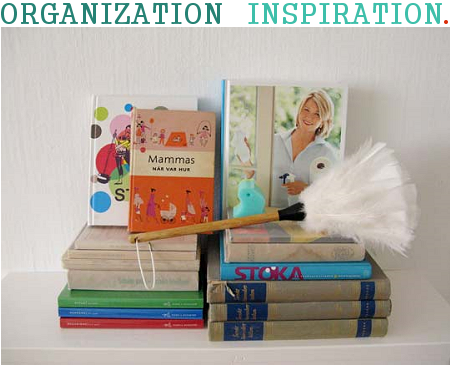 Expect more DIY organization and inspiration and tutorials throughout the year. 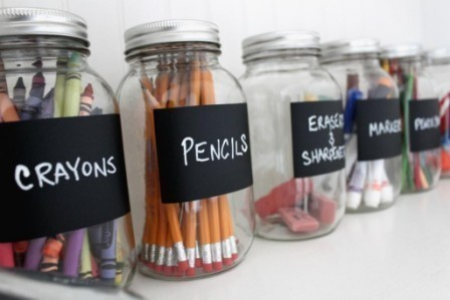 Chalkboard paint and thrifted mason jars make an amazing organization system for crafters and artists. Every item you need is clearly visible and accessible. Consider vintage suitcases for storage. They have great visual impact and are easily found for low prices at thrift store and flea markets. I use one for my everyday sewing supplies and one for my drawing supplies. I'll collect and revamp more soon. Small chalkboards make excellent "daily goal" and "task" boards in your office. 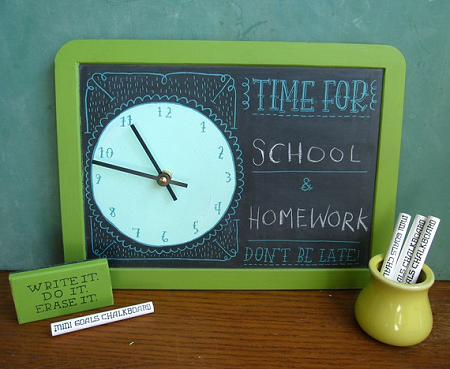 Make your own with chalkboard paint or look out for small ones when thrifting. Perhaps you can fashion a clock on one from old clock parts or a kit. Just a little inspiration for storing craft supplies neatly. When your craft supply case looks this neat and lovely, you'll be motivated to keep it that way! 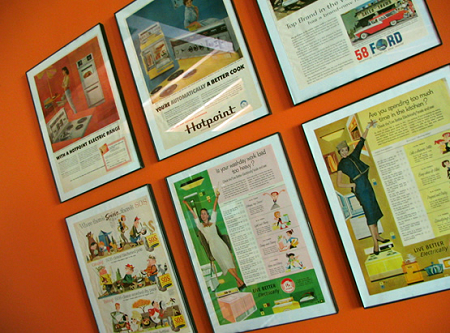 I love everything about this display of vintage ads: the wall color, the ads, the neat frame job. This inspires me to get to work framing my collection of vintage ads and other odd collected bits. Current Organization Progress: Last night I stayed up late to put things back where they belong. Clutter forms so easy when you're busy and live in a small apartment! I'm going to examine where this clutter forms and work on these problems areas for the rest of the week. What are You Doing to Keep Organized This Year? suitcases are THE best things to thrift, in my opinion. they're usually incredibly cheap and in good condition, and look beautiful no matter what. people don't even realize we have EVERYTHING stored in our common rooms, they just see well-organized, stacked beautiful suitcases. So inspiring. I have a lot to do! Cara: do you have pictures of this? I would LOVE to see and perhaps share this! Sounds amazing. Marcia and Laura: Still...so much...to do. I'm still culling junk, too! Year's worth of it! Ugh, organization is such a weak point for me. I'm so good at clutter and piles! lol Very inspiring post, I love the framed vintage ads, I have so many of them I need to do this too! Well I love the idea of organising and getting everything looking neat and orderly. Doing it and keeping it done is another issue. We moved my craft room into a bigger bedroom last fall, so I worked very hard to come up with a system I enjoyed using and looking at. I enjoy old glass containers, baskets, and hat boxes...so those are definatly in there along with some new modular scrap-booking systems. I love old train cases, like you featured. Unfortunately around here the thrifts mark them around 8 bucks, too much for me. I have one I found for 3 dollars that I actually use for travelling....I am hunting for a round hat box to match (I have a blue one but never have seen another leather luggage type). Now I need to work on those closets!!!! 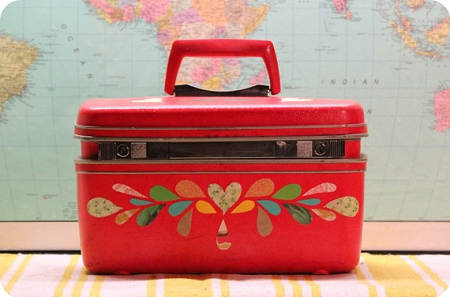 I LOVE vintage luggage for storage! I have one for random crafting supplies, and am always on the lookout for more great finds. Happy New Year and all the best in your organizing adventures! Oh I LOVE these ideas! My favorites are the Upcycled Mason Jar Storage & Tidy Sewing Case - SO cute! Vintage looks so amazing when used in these creative ways! Everything has such clean and simple lines, too - it would be a relief to have my house organized in this fashion. I have the Martha Stewart book in your first picture, too - I'm taking it out now because it's been way too long since I've looked at its helpful hints! Tiffany: My bedroom closets are terrifying! Mandy: I hope my house will look streamlined just like these pictures, too! Thanks for following on Twitter/Facebook! LOVE this!!! Thank you! I'm in the middle of an organizing project...so this is great! OOh I like the mason jar idea- beautiful! 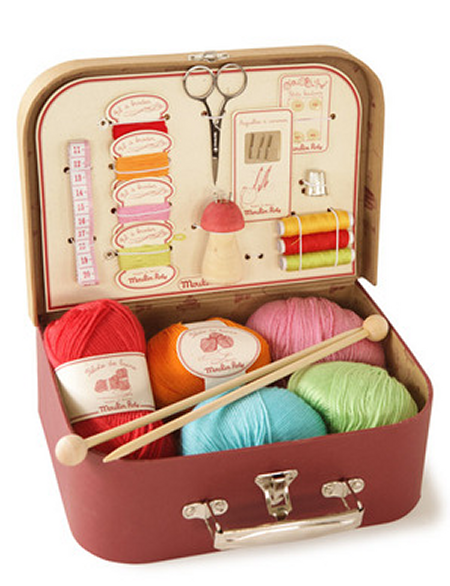 I like the sewing box too. Some excellent ideas!! I use vintage suitcases for storage too. And I appear to be accumulating some vintage vanity cases too! If you need a cosmetic dentist in plano to restore your smile and your expression counts a lot! If you ve come up with when offer dental services. need to confirm that you are seeing the actual work of the dentist. The various steps in the scaling and root planing procedure?